My emule Xtreme crashed,there's a pop-up asking me to creat a dignostic file,BUT the downloading still goes on!why?is it really crashed??? yes, although most likely only a part of eMule crashed that is not directly linked to the basic functions. create the dump and provide it to zz_fly. you best to that on forum.emule-project.net in the mods area where zz_fly is in the xtreme sub area. First, a big thank you for your hard work. It is much appreciated. I was wondering if you would be adding support for Save Upload Queue Waiting Time (SUQWT)? 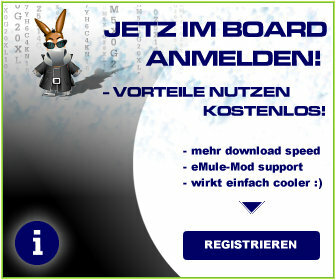 ich nutze den xtreme mod schon seit jahren nie probleme gehabt. jetzt bin ich auf den neuen 8.0 umgestiegen und da ist ein problem die funktion auto-update ipfilter.dat funktioniert nicht mehr (bei mir). bei der vorigen version gings einwandfrei immer wenn ich denn xtreme angemacht hab dann öffnete sich ein fenster und es hat sich aktualisiert. ich konnte es auch im traffic fenster beim du-meter sehen das er was runtergeladen hat. bei dem 8.0 tut sich nichts es öffnet sich kein fenster beim starten vom xtreme und im traffic fenster bewegt sich auch nichts. kann mir da jemand weiterhelfen ??? das auto update wird nur wöchentlich gemacht und überprüft vorher wie alt die letzte version ist (iirc). ergo wird es nur ein update geben, wenn das letzte eine woche zurück liegt und die version auf dem server neuer ist. es kann ohne weiteres sein, dass momentan eines der beiden kriterien nicht eintrifft. wenn sich im transfer fenster nichts bewegt, dann kann das verschiedene gründe haben. der wahrscheinlichste, es gibt nichts zu bewegen. I've upgraded to Xtreme 8 from 7.1 and have copied my friends list etc. to the new version. I noticed that some clients which are identified succesfully in 7.1 are not identified in the new version and so I can't establish friends slot with them. Has anyone checked that yet? if you copied your friendlist it should be alright. if they don't identify right, chances are they changed their user hash. Hi Stulle, thanks for the quick response. I have the both versions installed. I can switch between them and check them both. Same friends list but the old one identifies right, new one doesn't. Do you have any suggestions to check? you copied the emfriends.dat to your new config directory, along with clients.met, clients.dat, preferences.dat and possibly preferences.ini? elaborate how it does not identify! first of all thank you very much for this great mod, I'm using it since Sivka discontinued his work and I love this mod! But since the update to 8.0 I cannot exit eMule anymore over the tray icon. When I do right click on the tray icon and hit exit it woun't exit. Instead it continues running unusable, the only way to close it then is over the task manager with kill emule.exe process. When I exit eMule from the normal window (the X in the right top corner), it works fine. I'm running on Win XP SP3 with all latest updates. Is this a know bug or will I have to do a fresh install? During the update I just copied some files from the config dir, like history and known, etc... the rest was fresh, I even did a fresh configuration from scratch.